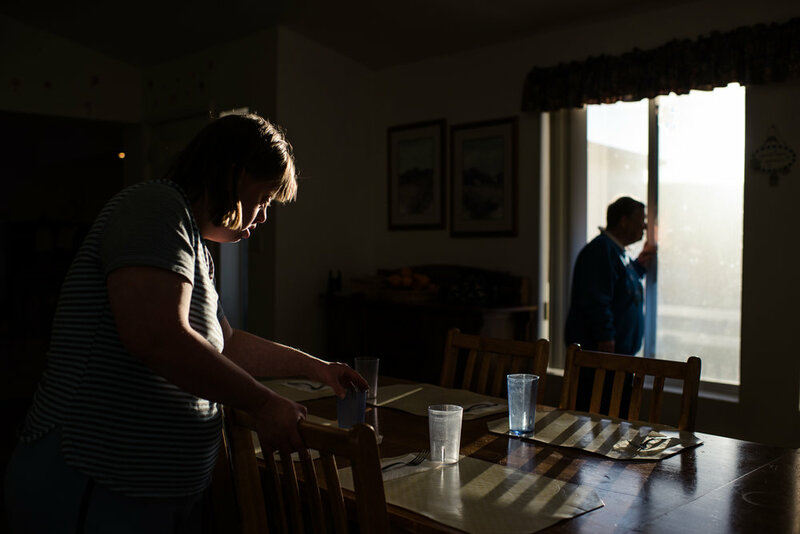 Outside of Los Angeles, at the foot of the Saugus Mountains, is the Los Angeles Residential Community (LARC) Ranch of adjacent group homes for developmentally disabled adults. Debbie, age 51; Barry, age 59; Krysta, age 24; and Nathanial, age 28 live in private rooms in communal homes. During the day, Debbie, Barry, Krysta and Nathaniel work together doing manual tasks designed to keep them mentally engaged. Many times a week, the staff takes Debbie, Barry, Krysta and Nathaniel to restaurants, stores and parks. Out of 100 participants, some have formed relationships and sit with their partner every day. A few are married couples, while others are in long-term commitments like Debbie and Barry. Some have lost love. Some struggle with accepting that a relationship is over and wait, hoping for reconciliation, while others find new partners. Debbie and Barry are sometimes in conflict over misunderstandings and distractions. Barry expresses feeling powerless when Debbie becomes emotional and he is unable to fix the situation. 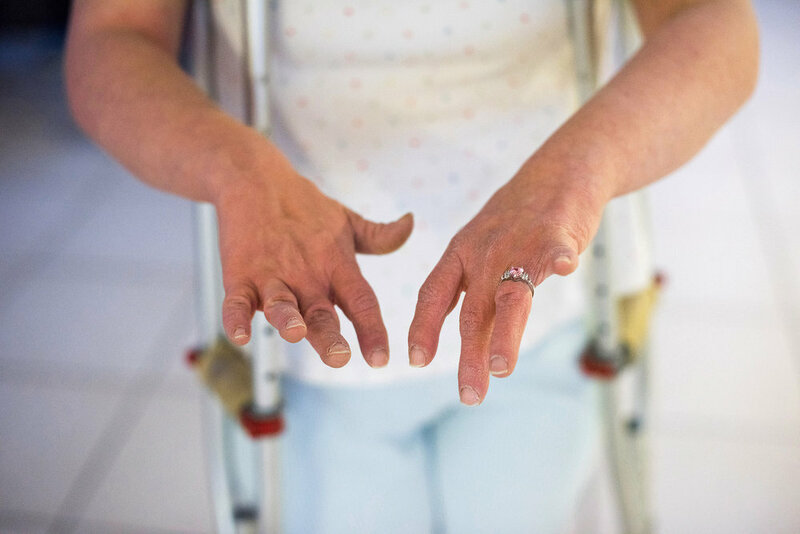 He describes, “I want to do something for her when she’s upset, but I can’t.” Sometimes when one might want to be alone, the other wishes for closeness. Nevertheless, regardless of the circumstance, the day ends with Debbie tapping Barry on the arm and saying, “I love you,” and Barry confirming that Debbie is “the only one for me.” Debbie and Barry formed their relationship thirty-one years ago at a daycare program for developmentally disabled adults in the San Fernando Valley, north of Los Angeles. In hindsight, Debbie describes, “I had nobody. He had nobody.” Twenty-one years later, when Barry’s mother decided to place him at LARC Ranch, Debbie asked her family to let her live there in order to be with Barry. Krysta and Nathaniel met when they moved to LARC Ranch. They met at a workshop and fell in love, and Nathaniel proposed to Krysta and hoped that, with her family’s permission, they would marry. After three years, the relationship ended and they are now friends. These relationships question the nature of romantic ideals as social construct and raise the question of how these individuals form their ideas about love and attachment. I am drawn to document intimate relationships within marginal communities. I was in search of subjects who readily showed vulnerability and embraced their emotions. Debbie, Barry, Krysta and Nathaniel hold no artifice. I wanted to observe what it looks like for people who display authentic selves to interact romantically. Romance is tainted with both personal desire and altruism; I endeavored to see if these couples mastered the balance or if this balance is a struggle. Krysta holds Nathaniel, as he watches a video during the workshop they attend daily. A view from above of LARC Ranch, a home to 100 developmentally disabled adults. Krysta and Nathaniel share a snack after the daily workshop. 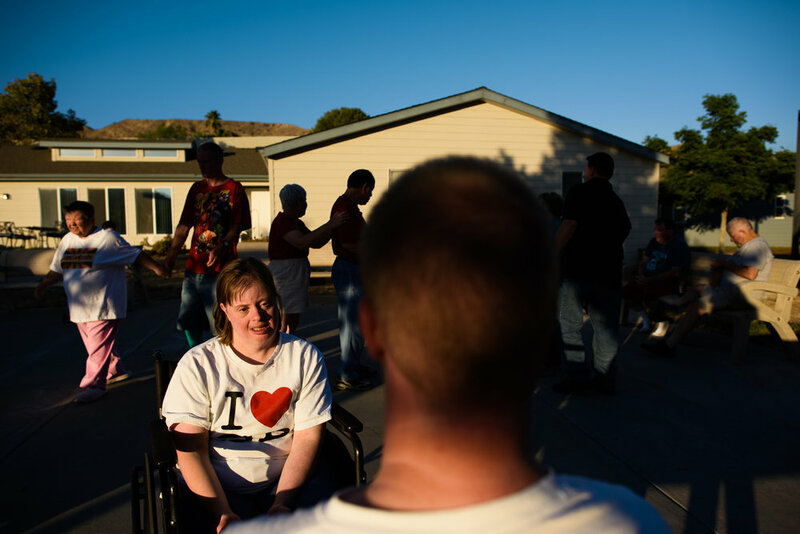 Krysta sits with Nathaniel during a dance party outside the homes at the ranch. Krysta removes Nathaniel’s sock at the beach during an outing in Ventura, California. The roof of a home at LARC Ranch. Krysta and Nathaniel kiss in her room. Krysta sits next to her friend, Sandra, who stands, waiting for the residents to be allowed back to their homes after the daily workshop. Nathaniel shakes hands with Gary, a participant of the workshop, after an argument, while Krysta holds Nathaniel’s arm in support. Krysta holds out her hands to reveal her engagement ring. Krysta leans towards Nathaniel to kiss him, as he holds her. Nathaniel does a puzzle in front of the television inside the group home where Krysta lives. Krysta holds Nathaniel’s head to calm him down as he experiences frustration towards the behavior of other residents. Krysta holds Nathaniel’s neck, wanting him to dance with her at the Halloween party; Krysta is upset that Nathaniel is ignoring her and is spending his time with other men. Krysta cries after the break up with Nathaniel. Krysta sits in her room at the ranch. Krysta dances with new love interest, , at the Valentine’s Day party inside one of the homes at the ranch. Krysta sets the table for dinner, as Ruthie, another resident, looks out the window. Nathaniel walks with his new girlfriend, Ruthie, around the property of the ranch where they live. Krysta flirts with Nathaniel outside the workshop. After 3 years of dating, an engagement, and a break up, Krysta and Nathaniel reinitiated their relationship after a few months of separation.